As a former secretary, 3@1 seemed a great fit for Tania Edwards’ existing skills. 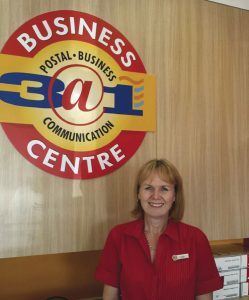 The franchise is a one-stop business centre focussing on communication, business and courier services, as well as the sale of associated consumables like cartridges and paper. “My years in an office environment were great preparation for the service industry and for what to expect from business customers,” says Edwards. She admits that each client brings their own set of challenges, but for Edwards this is part of the thrill of running her own business. “There is nothing better than finally extracting a proper brief from a client and then delivering a great solution,” she says. One of franchising’s unique selling points is the support offered to franchisees, and this is particularly relevant for Edwards. “As franchisees we’re given the independence to run with our own ideas, but are still fully supported by head office,” she says. Looking for a quote from one of our stores?